William Michael “Bill” Daley (born August 9, 1948) is an American lawyer and former banker. He served as the White House Chief of Staff after Rahm Emanuel successfully ran for Mayor of Chicago from 2011 through 2012. 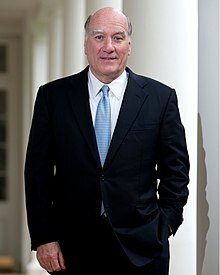 He is the son of Richard J. Daley and brother of Richard M. Daley (who's successor was Emanuel as Mayor of Chicago). He also was the United States Secretary of Commerce from 1997 through 2000. Daley was born on August 9, 1948 in Chicago, Illinois. He studied at Loyola University Chicago and at John Marshall Law School. He is married to Bernadette Keller. Daley was also a candidate for Governor in the 2014 gubernatorial election for the Democratic primary. On September 16, 2013, Daley made a surprise announcement that he was exiting the race for Illinois Governor due to the personal issues. After two-term mayor Rahm Emanuel announced he would not seek reelection, it was reported on September 14, 2018, that Daley would run for Mayor of Chicago. He came in third place behind Lori Lightfoot and Toni Preckwinkle. ↑ "Washingtonpost.com: Politics – The Administration, William M. Daley". The Washington Post. December 15, 1999. Retrieved 2008-05-12. ↑ Daley Says U.S. to Consider Using Oil Reserves as Prices Rise With Turmoil. Bloomberg.com. Retrieved on 2012-01-05. ↑ "Bill Daley drops bid for governor". Chicago Tribune. September 16, 2013. Retrieved September 16, 2013. ↑ "Bill Daley to run for Chicago mayor". 14 September 2018. ↑ "Live updates: Bill Daley concedes in Chicago mayoral race, as Lori Lightfoot and Toni Preckwinkle emerge from crowded field". The Chicago Tribune. February 26, 2019. Obama Taps William Daley for Chief of Staff – video report by Democracy Now! This page was last changed on 27 February 2019, at 03:56.